In their continued effort to find creative ways to educate and inspire kids, the Creativity Shell is inviting Houston kids to help sew hearts on washcloths for the organization’s “Hearts for a Fresh Start” campaign. Finished washcloths will be delivered to children living in shelters who have been rescued from human trafficking. The Creativity Shell is a Houston nonprofit organization on a mission to use creative trades to educate and inspire the next generation of makers. The organization teaches sewing/textile arts and other trades classes to students in public libraries, schools and shelters that rescue children from homelessness and human trafficking. Their programs are designed to educate and inspire children by teaching them essential life and practical skills. “Thirty years ago, the phrase human trafficking” was not as widely used as it is today.” Says Executive Director and founder of the Creativity Shell, Shelancia Daniel. “We have stopped teaching our children basic skills and traffickers are exploiting this weakness by luring them into the trafficking industry with a false promise of a fame and fortune with no skills required. Hearts for a Fresh Start is designed to raise awareness about human trafficking, teach a basic hand sewing skill and give a child the opportunity to give back to other children in need.” Daniel added. “Hearts for a Fresh Start” will be launched on Sunday January 14, 2018 at Okra Charity Saloon in Houston. 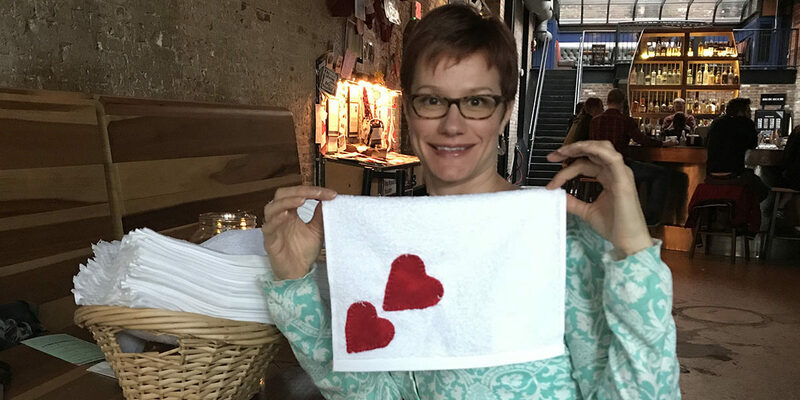 During the month-long campaign leading up to Valentine’s Day, the Creativity Shell is hoping to make/deliver 5,000 unique washcloths to shelters across the country. A location list of stitching workshops is available below and registration is required so the staff can prepare enough supplies for the students. To help pay for the cost of fabrics, supplies, and to help pay for the cost of the Creativity Shell outreach program that will teach free sewing classes in human trafficking, homeless, trauma and refugee shelters in 2018, the Creativity Shell is asking for a $10 donation/student when participating in a heart stitching workshop. If your school, church or group would like to partner with the Creativity Shell to co-host public heart stitching events, please contact Heather Jiang (hjiang@creativityshell.org). The Creativity Shell will provide all the supplies and an instructor to lead the workshop. If you cannot make it to a Hearts for a Fresh Start Workshops but would like to help the organization out in any other way; donations to the Creativity Shell is available online at www.creativityshell.org. In addition, the Creativity Shell is also one of the featured charities at Okra Charity Saloon in Houston this January. Consider voting for them after purchasing a drink. This list is currently being updated – Please check back soon.